Forgotten NY correspondent Gary Fonville, a former NYC bus driver, points out an anomaly on this building at Atlantic Avenue and Wyona Street that has me stumped…. …if you look up at the second floor, there are a couple of chiseled signs denoting the cross streets, common practice on buildings of a certain age. 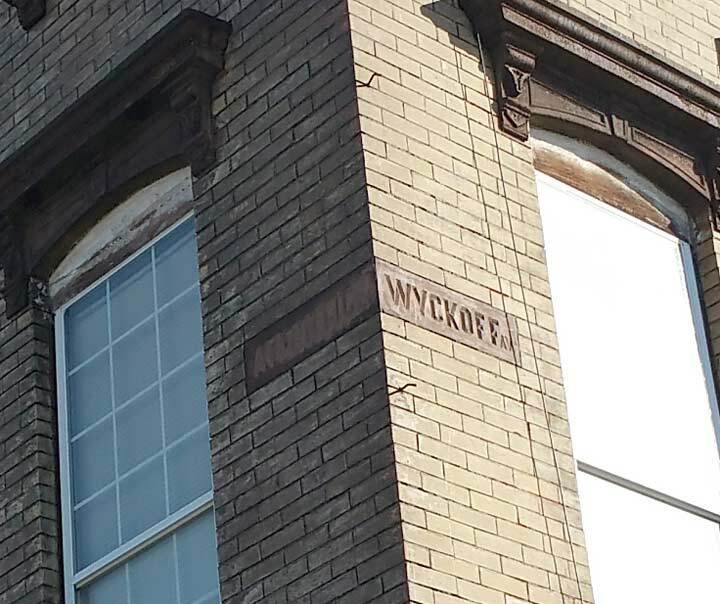 However, the sign says “Wyckoff Av” not Wyona Street. 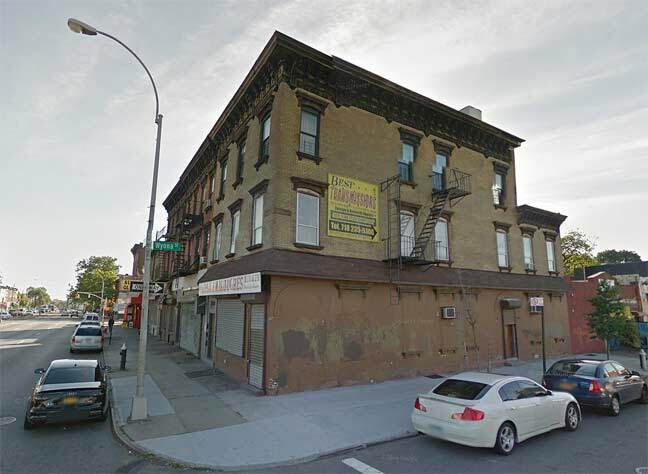 Now, there is a Wyckoff Avenue in Brooklyn, on the Bushwick-Ridgewood border. It’s in Brooklyn most of its length, but the borderline runs down the middle for about a dozen blocks, and then it’s entirely in Queens. Now, if you wanted to get creative, and draw a curved line through Evergreens Cemetery and then south, you could connect Wyckoff Avenue and Wyona Street, which runs from Jamaica Avenue south to Linden Boulevard, but I’m pretty sure that’s not what’s happening here. This atlas plate was made in 1890, when the town of New Lots hadn’t yet been annexed by Brooklyn (and then by NYC in 1898). Even then, the street was called Wyona Street. So what gives here? 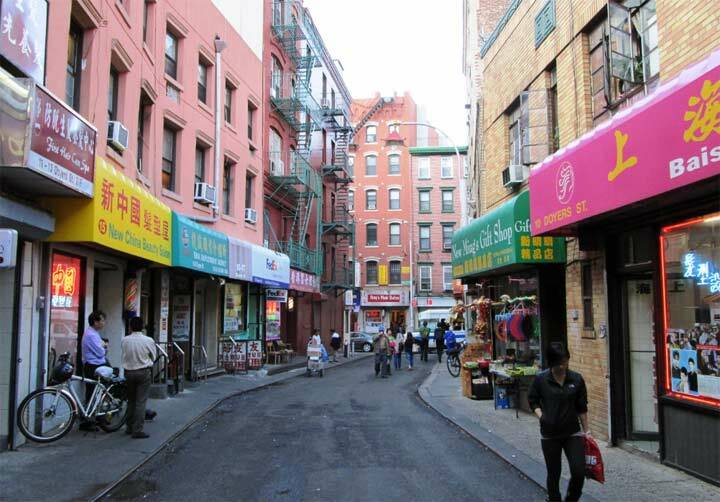 The redoubtable Eugene Armbruster had nothing to say about Wyona Street in his street list. The etymology of “Wyona” is also a mystery to me; it could be a Native American word. 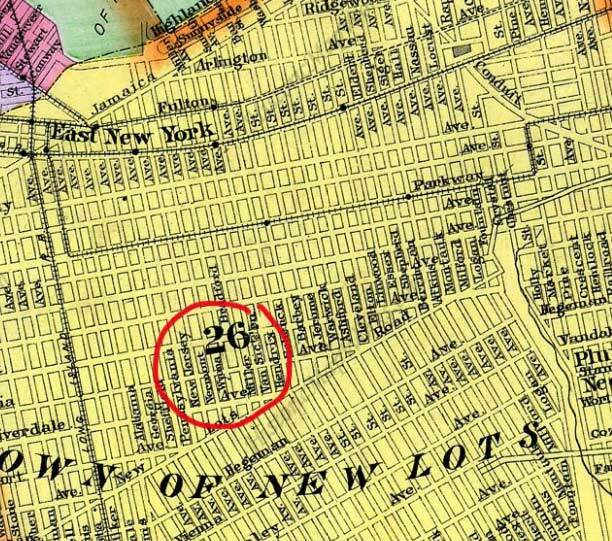 In addition, Ditta provides this atlas plate from Robinson’s 1886 atlas of Brooklyn showing Wyckoff Avenue. 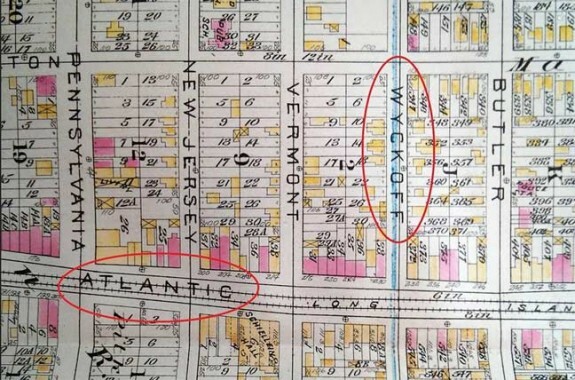 There’s also a list of proposed street name changes in the 26th Ward (East New York) in 1887 that mentions a change from Wyckoff Avenue to Wyona Street. Was formerly Wyckoff Avenue, laid out about 1854 by Charles R. Miller. Thanks — is that available online? The building was called the Blue Mirror Tavern for many many years. It was built in 1933. Why they chose to pay homage to the old street name is anyones guess. The 1942 Edition, Brooklyn’s Eastern District, isn’t available for online reading. You can find hard copies for sale, though. I paid thirty six bucks for mine. Interesting thing about the book is that it was actually completed in 1928. There was apparently a transition from Wyckoff Lane, to Wyckoff Avenue, to Wyona Street. See the Brooklyn Daily Eagle, June 11, 1887, p.2, col.3, 6th entry concerning Recorded Conveyances: “Wyona st, formerly Wyckoff av”. Notice that the old street atlas above has Pitkin Avenue listed as Eastern Parkway. As the City of Brooklyn continued to expand eastward beyond Ralph Avenue, it would have made sense for Eastern Parkway to continue its straight route east towards the Queens border. But the purpose of parkways was to connect parks and to other parkways. For that reason, when Highland Park was completed, Eastern Parkway’s extnesion beyond Ralph Avenue was isntead rerouted in a northeast direciton towards highland Park and later Interborough Parkway. The initial planned extension of Eastern Parkway was then renamed Pitkin Avenue. I noticed the old Fulton Street extension which at that time terminated at Grant Avenue or City Line. In the early twenties this line was extended to Liberty Avenue. I remember taking that line as a child and making the sweeping turn at Conduit Avenue and Euclid Ave towards Pitkin Avenue. I noticed the old firehouse at that intersection was still there a few years back. I remember looking down on it so many times on the way to Brooklyn. I don’t know if it’s still there or not. I also remember the crazy turn the Manhattan bound L train had to make at the Atlantic Avenue station because of the connecting configuration with the Pitkin Avenue Line. I loved traveling on that El, and I missed it when it was torn down past 80th Street.